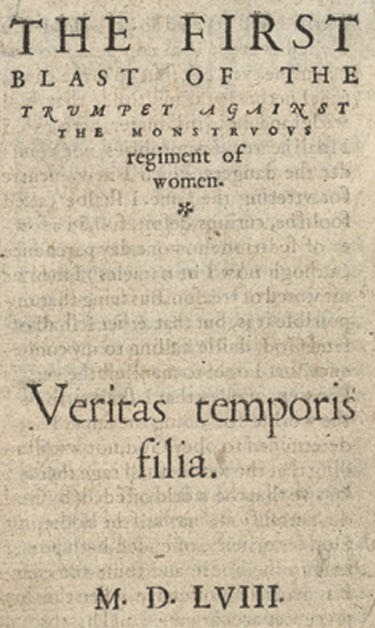 What Does "The Monstrous Regiment of Women" Mean? To promote a woman to bear rule, superiority, dominion or empire above any realm, nation, or city is repugnant to nature, contumely to God, a thing most contrarious to His revealed will and approved ordinance, and finally it is the subversion of good order, of all equity and justice. Shortly after Knox’s work appeared in print in 1558--and most unfortunately for Knox--Elizabeth Tudor succeeded her sister Mary on the throne of England, and, in France, Catherine de’Medici was soon become regent for her son, Charles IX. Meanwhile, across Europe, many more women ruled independent principalities, counties, duchies, and city-states, as they had for centuries—quietly going abou t the business of governing despite Knox’s objections. To view selections from Knox's Blast, made available online by the British Library, click here. More shockingly, the title has been used straightforwardly by filmmaker Colin Gunn in a 54-minute “documentary” that embraces Knox’s views of women and their "incapacities." While Amazon reviewers give the DVD accolades and 4.7 stars (as of 2014), RationalWiki describes the film as: "an anti-abortion, anti-feminist propaganda film produced by the Gunn Brothers, featuring fact-free and fecklessly unattributable interviews with pregnant women and women who wish they were pregnant, railing against women who aren't, including Model Homemaker Phyllis Schlafly and other women of the religious right." And that, I would say, is putting it nicely . . .
I’ve provided links to most sources—you’re on your own with the Gunn film . . .